– Living room with TV. – Individual heating with pellet stoves and electric radiators . 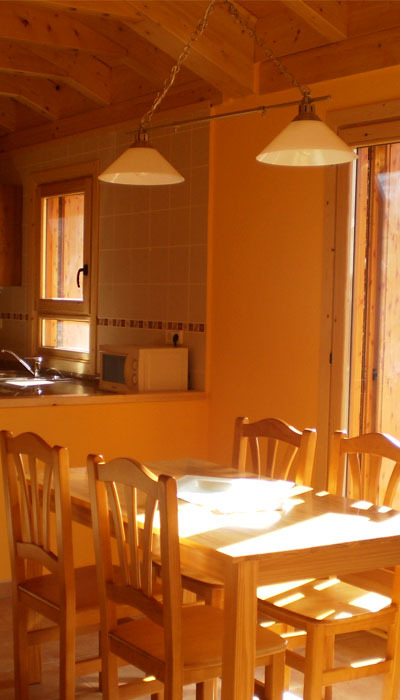 – Fully equipped kitchen with oven, hob, fridge, freezer, microwave, toaster and dishwasher . – Fully equipped bathroom (there is a washing machine and hairdryer). – A double bedroom with double bed. – A double room with two beds. – Sheets, towels, tablecloths, napkins and tea towels included. – We have cutlery, cups, plates, pots, pan , kitchenware , … and iron and ironing board . – We have a cot and high chair (please ask for them when booking ) . – We have table games. – We’ll give you information about the activities you can do in the area. – You can park right next to the houses. Take a look at our houses through this virtual tour!